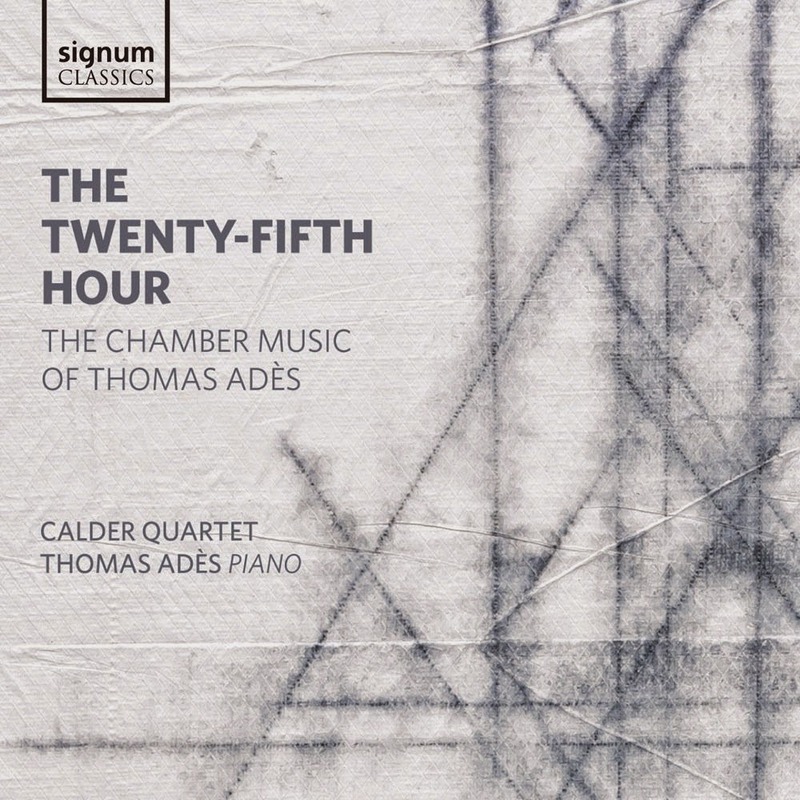 This new disc of chamber music by Thomas Ades on Signum Classics showcases music written over a 20 year period, ranging from Arcadiana (1993), through Piano Quintet (2001) to the world premiere recording of The Four Quarters (2011). The performers are the Calder Quartet (Benjamin Jacobson, Andrew Bulbrook, Jonathan Moerschel, Eric Byers) , with Thomas Ades joining them on piano for the Piano Quintet. We start in the middle, so to speak, with the Piano Quintet of 2001 which was commissioned by the Melbourne Festival for the Arditti Quartet. The piece is in one single movement span, though on the disc it is tracked in three parts, and in structure it represents a highly complex response to traditional forms. It starts with just a solo violin and throughout textures are spare but Ades ensures that lack of density does not imply lack of complexity. He is fond of using small groupings of instruments, and though there is a very strong central development section we are a very long way from the traditional big romantic piano quintet. There were moments when the night music of Bartok was called to mind. Ades also plays with time, both speeds and time signatures, and the whole recapitulation is highly compressed, with a similar increase in density leading to highly complex final pages. The Four Quarters for string quartet (2011) was premiered at the Carnegie Hall by the Emerson String Quartet. The four movements, Nightfall, Serenade: Morning Dew, Days and The Twenty Fifth Hour take the listener through the diurnal cycle. The opening movement starts with music on two different planes, violins playing harmonics in a regular pattern (short, short, long) and far below these the viola and cello in slow harmonies together. The result is highly evocative and magical, and throughout the long movements (over seven minutes) there is a sense of the two planes coming together, coalescing and then receding. It is an intense, concentrated and thoughtful movement which receives playing of superb control and poise by the players. Serenade: Morning Dew is more of a scherzo with string pizzicatos, though there is an element of violence in the plucking, with some perky underlying rhythms. Days is described by the booklet notes as a study in monotony! The instruments have a gentle circling round a repeated note from the second violin, and it is this repeated note which increasingly dominates and takes over the rhythms before it all unwinds. Finally The Twenty Fifth Hour, the time outside time, where we return to the magical textures with upper harmonics and a plucked cello, creating a sort of continuum, a perpetuum mobile. The last work on the disc is the earliest, and in many ways the work which is most indicative. Arcadiana (1993) is in seven short movements each of which take a title which refers in some way to a vanished idyll. I Venezia notturno, II Das klinget so herrlich, das klinget so schon, III Auf dem Wasser zu singen, IV Et… (tango mortale), V L’Embarquement, VI O Albion, VII Lethe. The opening movement is based on the rhythms of a Venetian gondolier, in the viola, surrounded by a magical (that word again) web of shimmering slides and textures from the strings, creating a hypnotic night music. Shreds of a waltz come in, and there are fragments of quotations which I failed to recognise. The second movement's title is a quotation from The Magic Flute and this combines a lyrical yet vigorous song for the cello with bird-like harmonics from the violins. The third movement refers to a Schubert song, and uses the song in the movements structure, but the result are highly intense and dramatic. The rather curious title of the fourth movement hints at the Poussin picture, Et in Arcadia ego but it comes out as a mortal tango. At first the movement is all rhythmic structure, overlaid with more dramatic writing and string slides, a mesmerising de-construction of a tango but then the movement leaves the tango far behind for more mysterious waters. L'embarquement refers to the painting L'Embarquement pour Cythere by Watteau, and there are hints of a delicate waltz, quotations from Debussy's L'isle joyeuse, amidst the shimmering effects. O Albion is a quietly intense meditation on Elgar's Nimrod (the work's first performance was a the Cambridge Elgar Festival), then finally Lethe the waters of forgetfulness, which is all shimmering and mystery embedded with evocative fragments and quotations. The remarkable thing about the work is that for all the variety of source material and approach, Ades has created a consistency of texture and grain throughout the movements so that the seven seem to be woven from one clothe and achieve a striking synthesis. Throughout performances are superb. 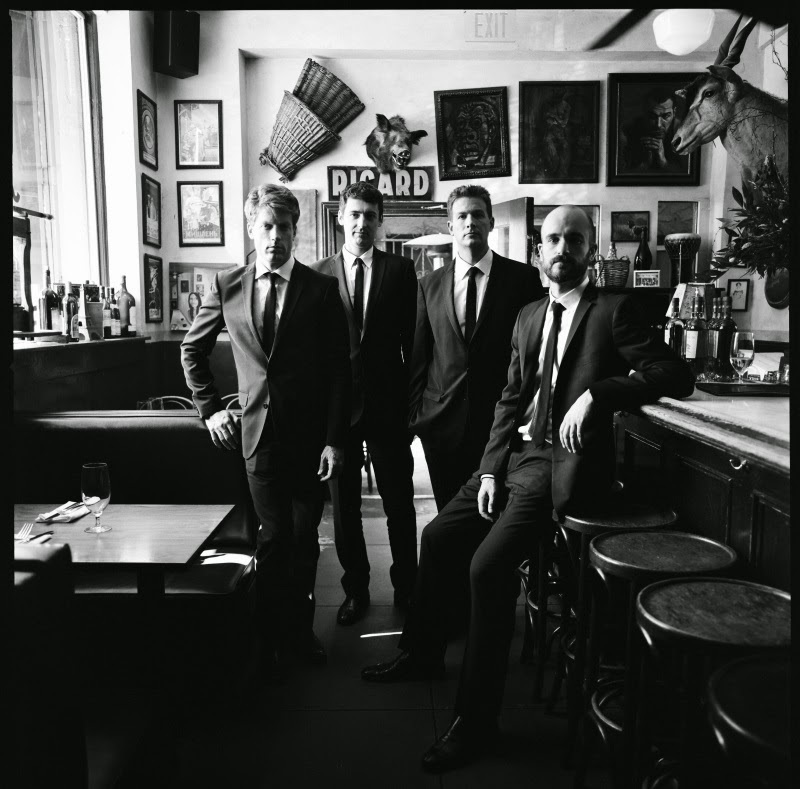 The Calder Quartet is a young American group who originally worked with Ades on Arcadiana and then developed a relationship with him which led to concerts in Stockholm (2009), Melbourne (2010) and CAL (2011). They seem to play Ades' music with more than just technique (good though that its), and show a really sympathy and empathy for his evocative style. The music on the disc is all evanescent and atmospheric; I have used the word magical more than once and it is a magic of structure as well as beauty of sound.